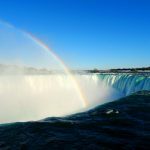 Whenever a host city focuses the spotlight on an internationally recognized event, it leaves in the shadows attractions and destinations that define the city every other day of the year. I challenged myself to discover what Augusta, Georgia had to offer off the course on Thursday morning of the Masters weekend. A cab from Augusta National Golf Club to downtown Augusta on Masters weekend meant standardized premium rates: $30 one-way for an eight-minute cab ride. After travelling Asia, I know I’ve been ripped off before, but this was absolute highway robbery! With no other choice but Yellow Cab of Augusta, I bit the bullet and headed into town. It’s a continued debate amongst travellers on whether to unplug from their mobile devices or to stay connected. I’m an advocate of staying connected, especially when using TripAdvisor’s “Near Me Now” option on their app. 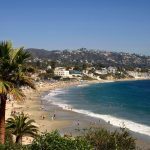 This allows you to locate restaurants, attractions and accommodations, ranked in highest rated order based on their distance to your current location. It’s a great tool that helps plan your route to see more and save time. 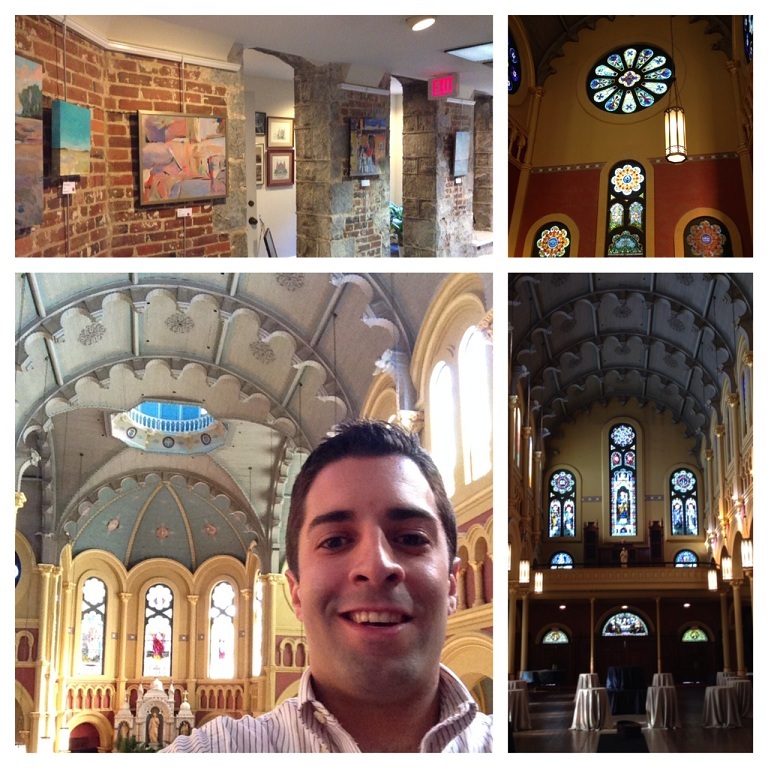 After consulting my app, my first stop was the Sacred Heart Cultural Center. This former Catholic Church built in 1898 in the Romanesque and Byzantine design was active until 1971. A year later it was listed on the National Register of Historic Places and was re-opened in 1987 as a cultural center. This free attraction comes with a self-guided tour pamphlet that takes you through the history of the interior, Great Hall, main altar, and up to the choir loft. Since I was there only minutes after it had opened for the day (Monday-Friday 9am-5pm), I wandered through the ancient basilica in silence. The basement is a must-see for any art lover, consisting of local and regional artists working in different styles and mediums. As a former Catholic Church built in 1898, the Sacred Heart Cultural Center is now host to community events and local art. Of course, I wouldn’t rely solely on a travel app for your adventures; let yourself get lost too. As I wandered aimlessly around Augusta, I stumbled upon Springfield Village Park. Tucked away just off the main strip of Broad Street on 12th Street is a 2.5-acre park featuring a 45-foot stainless steel sculpture called the Tower of Aspiration by artist Richard Hunt. The park celebrates the legacy of the oldest African-American church in the United States, Springfield Baptist Church. 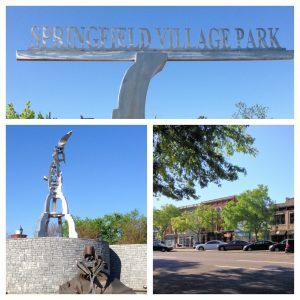 Springfield Village Park celebrates the legacy of the oldest African-American church in the United States. Carrying along near the Savannah River front, I headed over to the Augusta Riverwalk which spans between 6th and 10th Streets. At the 10th Street Plaza, you will find the Heroes Overlook, dedicated to those brave men and women who lost their lives in military duty. It’s definitely a spot to stop and reflect while looking over the calm Savannah River. A bit further down, you’ll come across the Japanese Pocket Gardens built in 1993 to honour Augusta’s sister city Takarazuka, Japan. At 10th Street along the Riverwalk is the Morris Museum of Art and as an art lover, I had to visit the first gallery in America dedicated to art of the American South. Opened in 1992, its permanent collection was established in 1989 with 230 paintings from collector Dr. Robert Powell Coggins. 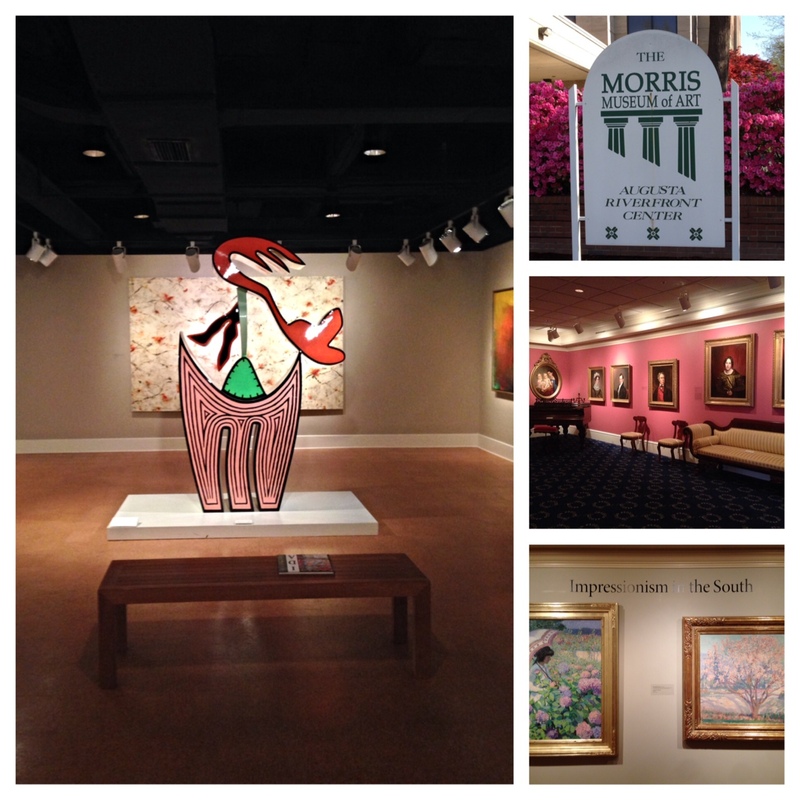 With 10 permanent exhibits complemented with 4 featured exhibits, the Morris is well worth its $5 admission. The pieces are a window into the authentic Southern stories of the past, as well as a look into the future with “Abstraction in the South”. The museum itself is a marvel; just avoid the cliché gift shop which degrades the entire experience. The Morris Museum of Art is the first gallery in America dedicated to art of the American South. 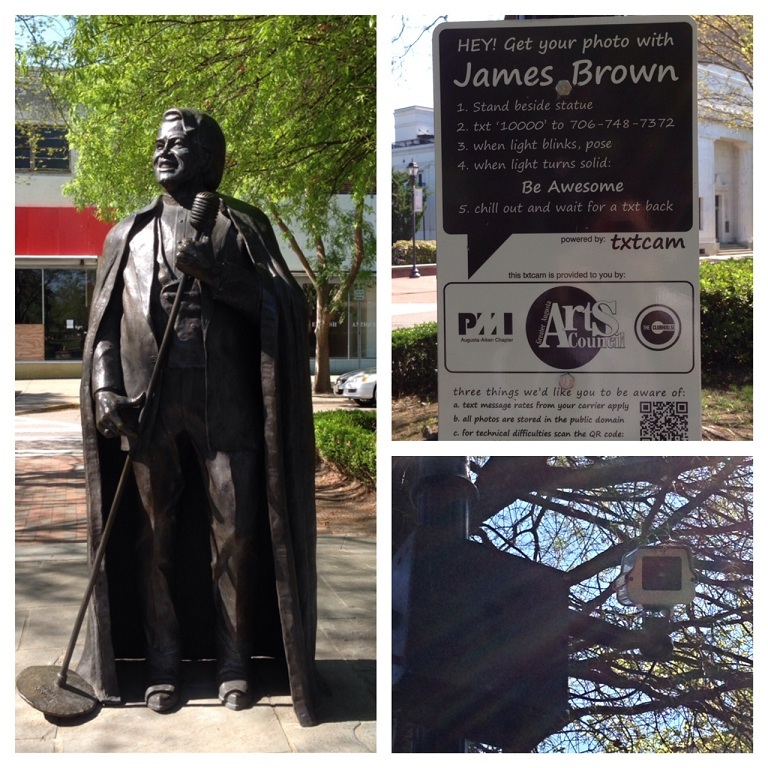 A fun, stumble-upon gem on Broad Street is the James Brown Statue. The Godfather of Soul grew up in Augusta, Georgia proudly calling the town home. In honour of his accomplishments, the town erected the statue in 2005 along with one of the coolest ideas I have ever seen: TxtCam sponsored by the Greater Augusta Arts Council. All you have to do is text a number, count to 3 and wait for the camera posted above you to take a photo! Hidden in the middle of Broad Street is this James Brown statue that lets you take a selfie, triggered by an SMS message. 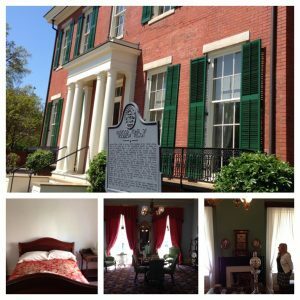 My final attraction for the morning was Georgia’s oldest presidential home: The Boyhood Home of President Woodrow Wilson. 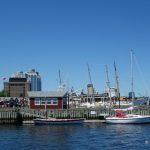 What sounded boring on paper ended up being my favourite attraction in Augusta – I highly recommend a $5 tour available Thursday to Saturday from 10am to 4pm. The 28th President of the United States grew up in this Civil War manse from 1860 to 1870 while his father served as pastor of the First Presbyterian Church. Conveniently enough, he grew up next door to Associate Justice Joseph R. Lamar of the Supreme Court of the United States; talk about a political block! 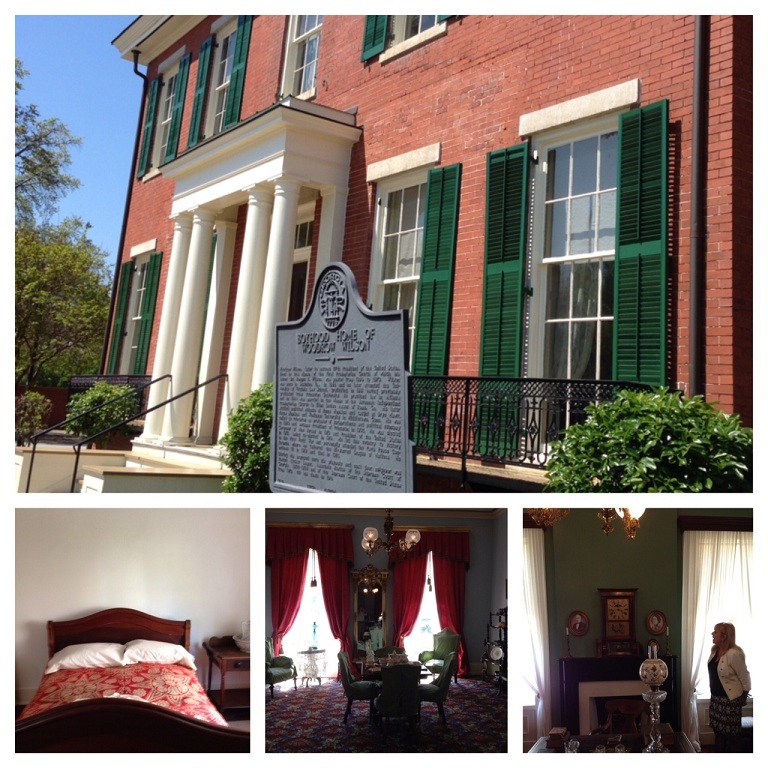 Stephanie, the main guide for the Boyhood Home of President Wilson, is the absolute definition of Southern Hospitality. On a private tour, she kept me engaged narrating the story of Woodrow “Tommy” Wilson’s early days in such a way, you felt like you slipped back into another era. In order not to spoil it for any future visitors, you’ll just have to go and hear the stories that formed the character of a President that led the country into the First World War. The 28th President of the United States, Woodrow Wilson, grew up in this Civil War manse from 1860 to 1870. Stephanie, in typical true Southern Hospitality fashion, provided a list of recommendations that would surely make my trip even more memorable. One of her suggestions was an authentic restaurant in South Augusta called Sconyers BBQ. 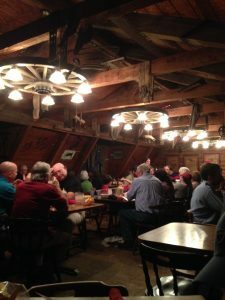 Only open Thursday, Friday and Saturday from 10am to 10pm, this hidden southern BBQ restaurant is a prized gem of Augusta and a fan favourite by those on The Hill in Washington, DC, including former President Jimmy Carter. Walking up to the restaurant, you are greeted by a live band and a friendly hostess. The décor is as authentically southern as the BBQ itself. I highly recommend the house specialty “Plantation Platter” which includes ¼ chicken or sliced turkey, 2 ribs, chopped beef and chipped pork served with a loaf of bread, hash with rice, pickles and either coleslaw or potato salad, all for $22. This heart-attack waiting to happen fills the soul with its flavour and is the kind of thing you witness Adam Richman tackle on Man vs. Food. Sconyers BBQ is the authentic taste of southern BBQ in South Augusta. 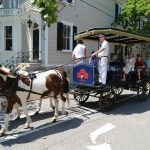 This Augusta, Georgia “Off The Course” self-challenge reminds us not to overlook permanent attractions when a temporary event, like the Masters Tournament, takes over a destination. The same concept can be applied to business travel. Do what you can to carve out time to get a taste of the local culture and attractions – it’ll add a new appreciation to the entire experience.